Updating your WordPress via the automatic method is highly recommended by experts. But this isn’t always possible. But not to worry, there’s an alternative. In a situation where one-click or the automatic WordPress update isn’t probable, the manual method can also be used. But care has to be taken so as not to run into errors. 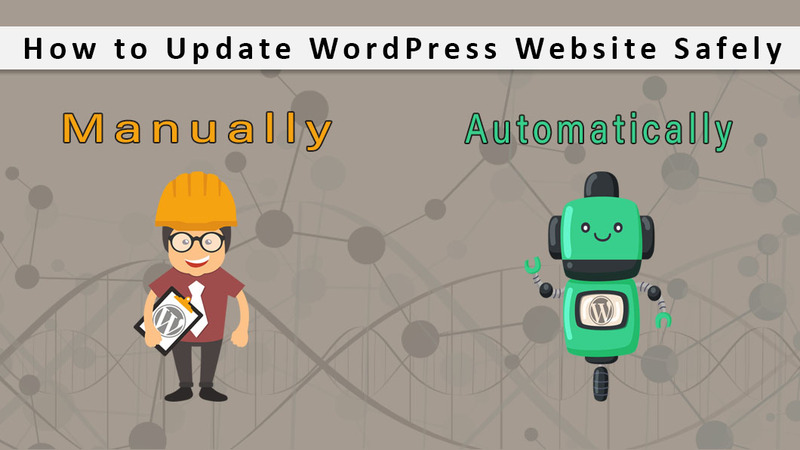 Many users prefer automatic updates of WordPress plugins as they are tired of the process of updating a plugin regularly. Users ask want to know if it’s advisable to employ trusted developers to carry out auto-update plugins. However, whenever a security or even minor release is available by default. However, it should be noted that WordPress has the ability to update itself automatically, most especially in the case where security or minor releases are available. But in the case of major releases, the user has to initiate the update by themselves. Secondly, theme updates and plugins also have to be installed by the users. Installing these new updates has the added benefit of having new fixes and features. Why should we update WordPress? Updating WordPress installations on a regular basis is very important for security. With the growing security concern from firms that conduct business via WordPress websites, and also consumers who use these websites, of this content management system. This doesn’t discredit the WordPress in any way as WordPress has a facility in place to monitor the platform and carry out necessary software update as soon as vulnerability is discovered. WordPress is one of the well-known CMS making it a victim of a great percentage of attempts by hackers. WordPress also faces bugs and vulnerabilities which have dangerous effects. In securing a WordPress website a lot of factors need to be considered from, securing PHP, making use of a SSL certificate and conducting security audits regularly. But the most important of all is to make updating WordPress a priority. Plugins and themes also have been updated. The absence of this update affects the security of the site. WordPress updates helps in fixing and patching security holes, making it difficult for a hacker to break in. Nobody wants to waste time in a slow and unresponsive site. With each WordPress update comes optimization with the sole purpose of increasing the speed of the website. Any new version comes with these upgraded features and functionalities. All these are geared to make WordPress work efficiently. This update improves the work efficiency of a WordPress owner and also plays the role of improving the experience of visitors on your website. How to update WordPress automatically? The task of updating a website can be mind-numbing; the situation becomes annoying when tasked with updating more 2 websites. But the situation is better with the introduction of automatic updates by WordPress 3.7. This automatic update helps make the site administration process of the easier and also develop the installation security. Below are steps to be followed in automatically updating your WordPress. It’s of dire importance to have backups of a WordPress website saved on a daily basis, even when the updates aren’t processed manually. This is done by using a backup and restore plugin. This is safe option, just in a situation where there’s a mishap during the automated updates. With this procedure taken, the old version of the WordPress site can be restored from the backup. With the aid of WordPress back up plugins this all can be handled. This comes in handy for those of us who are not developers, as WordPress automatic updates can be controlled using a plugin. Easy Updates Manager aids user to take control of WordPress updates on single or even as much as multiple site installations. With this free service won’t have to be disturbed with notification of waiting updates, this easing his or her work. As soon as the plugin installed, there is also need to configure the settings. The plugin gives room for managing all the typologies that are required of WordPress updates. User blocking, logging plugin updates and notification emails are the additional features available. Where you need professional assistance with the right plugins to choose from, a good marketing agency can be employed. This is necessary to ensure that the site is fully optimized for search engines. Instead of using just one plugin for handling backups and updates, Why not preferably make use of one tool that consolidates all the both functions into one? ManageWP perfectly manages the work flow. ManageWP has the ability to ability to manage a good number of website updates from just a single dashboard. One other specific function that users applaud is its ability of scheduling backups on a daily basis and saving to the site destination of your choice. Apart from work flow ManageWP also adds value to the level operation, health and security of the WordPress website. Take a general look at your website to see if everything is functioning well. Check to see if your page and post display haven’t been tampered with by the update. If everything is intact, it is advisable to back up the website again. This is simply done to have an updated version of the website saved. The level of changes to the site’s structure should be well contained. The recent image of the website should also be backed up. How to update WordPress manually? Once you are notified that an update is needed, backup your databases, uploads, themes and plugins. In order, for this to be done manually make use of a backup and restore plugin. A zipped copy of the backed up file can be save in a secure location in case a situation arises where there’s need to restore it. When manually updating your WordPress, all the active plugins has to be immediately deactivated before the update kicks off. It has also been recommended by WordPress that your plugins should be deactivated before updating the core manually. This is done to avoid problems that normally occur if otherwise. This is simply done by selecting the plugins that are to be deactivated and selecting the deactivate option from the menu at the top. It is essential to replace the old version of WordPress with a newer version. The step to be taken here is making use of SFTP from your control panel to locate the old files. The old files would be found under wp-content. There’s also need to delete the wp-includes and wp-admin. Also delete the plugins and theme files that are already old. New files should then be added to the wp-content directory. The new versions are uploaded into the previous ones. This overwriting function plays the role of updating all the previous plugins and themes. A lot of people are concerned of the fate of their media files and other plugins and themes. All will remain intact and in good condition. Use SFTP or SSH in the control panel to log into your root directory. When in the directory replace all the old folders available with newer ones. All the files with the exception of wp-config.php will be overwritten. The reason for this is the new version previously downloaded doesn’t contain wp-config-php. This file can be located in the archive folder downloaded but with a different name, wp-config.php. The next step to be taken is to check the files to ascertain if wp-config-sample.php has any new lines. If in any case a new line is found, copy and paste the line into the old wp-config.php. Jason Mayo composes on Digital Marketing, Real Estate, Shipping, Medical and also Logistics associated topics. His write-ups are enjoyable to check out and also extremely intriguing. He is versatile in creating interesting drafts and also his interests depends on numerous different areas of writing.